Jocelyne Loewen – MoonFigures Collection, Art, and Reviews! Jocelyne was a pleasure to meet. When I first found her table it wasn’t because I noticed her lovely blond hair, it was because she was seated next to Scott McNeil and his line up was what looked like a mile long. She was sitting quietly at her table with a bright smile on her face watching his insane energy work wonders on everyone he met. 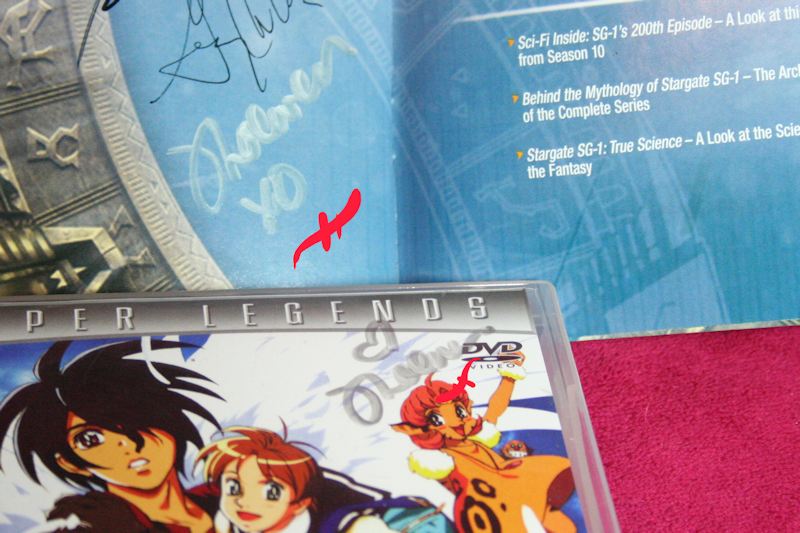 We spoke for a bit about Escaflowne, the Barbie movie series, and how much fun it was to play on Stargate SG-1 and I managed to get her autograph on both my Escaflowne box set, and SG-1 box set episode guide. If you ever see her attending your local con I highly recommend visiting her. She’s such a sweet heart and just SO adorable. You will leave her booth feeling just a bit lighter and happier.